Ezra was part of the Jewish diaspora who had been deported to Babylon when it conquered God’s people. It was Persian policy to allow peoples they’d conquered to worship their own “gods” and to return to their homelands. A group had gone back to Judah during the reign of the Persian king Cyrus. But they had neglected the worship of God and the observance of their faith. When Ezra, still in exile, learned of this, he was aggrieved. Ultimately, he received authorization from King Darius (who reigned from 522 to 486 BC) to return to Jerusalem and rebuild the temple. Ezra’s concern in this verse is the authenticity of his faith and his witness to the Persians. He had assured King Darius that he and his group would need none of the king’s offered protection of armies on their return to the promised land; God would protect His people. Ezra had prayerfully asked for God’s protection, yet must have still been daunted by the dangerous journey ahead. (It’s comforting to know how human this man of God was!) Because of his confession of faith in God, Ezra says that he was ashamed to ask for protection. Instead of petitioning the king for protection, Ezra and the Jewish believers who were taking a dangerous trip to go back to their homelands, “fasted and petitioned our God about this.” They chose wisely. Listen: This is no “name-it-and-claim-it” text. For Ezra, the decision not to accept the offered help of an army was a matter of faith. Nations and armies can’t protect believers. Neither can money or possessions, reputation or human affection, having the “right” argument or being “strong” and intimidating in numbers. Only God can protect us. And that would have been so even if Ezra and his contingent had been slaughtered on the way to their homeland. Ezra wanted to live in faithfulness to that confession. It would have been a defection from God to seek protection from a foreign army when he confessed that his “help is the name of the Lord, the Maker of heaven and earth” (Psalm 24:8). He also would have been ashamed to give a “splintered witness” by taking help from Darius when he’d already declared his certainty of God’s help. Early Monday morning, Mark Brennan, our director of worship; Sue Buck, our coordinator of children’s and family ministries; and I flew from Columbus to Denver for Lutheran Week. This annual event incorporates theological lectures, a mission festival, and the North American Lutheran Church convocation. Nancy O. joined us later in the week as your lay representative. Much of our week devoted to considering the Person of the Holy Spirit. This was our focus because, as Bishop John and others at the event pointed out, the Church and individual disciples can get involved with a lot of things. But if the Church doesn’t tap into the power of the Holy Spirit and pursue its one and only mission, it won’t get done. Not the government. Not social service agencies. Not fraternal organizations. Only the Church. As one of our speakers pointed out, Christians often think that the only thing Jesus calls us to do is follow Him. As a consequence, we turn following Jesus to some vague attitude of mind and heart. But at a presentation of the NALC’s Life to Life Discipleship team, one of our speakers said that the words of Jesus in Matthew’s gospel show us that there’s more to being a disciple of the Lord Who saves us by grace through faith in Jesus. Jesus gives them in this verse: Follow me, go where I send you, seek to bring other people to know and follow Jesus too. It’s exhilarating being part of a denomination that is focused on being and doing what Jesus calls us to be and do! 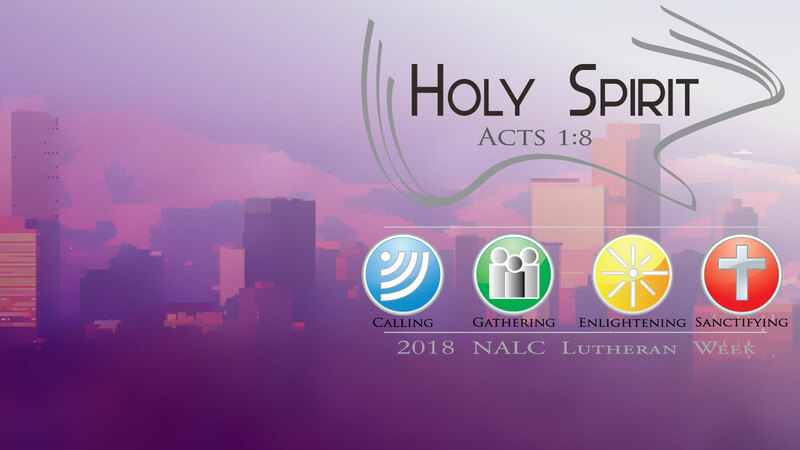 And it was so affirming to know that I’m blessed to be the pastor of a congregation whose mission of reaching up, reaching in, and reaching out is in sync with the Word and the will of our Lord and with the leadership and the most faithful and forward-looking congregations of the NALC. We were also given a succinct triple play of discipleship. It happens when, individually and in small groups, we believers not only read God’s Word, but ponder it, letting it soak into our lives and wills. Application, when I ask God to show me how to apply the truth of God’s Word I’ve read that day. Accountability, when I gather in groups of two or three others or when one couple gathers with two other couples, and ask one another things like, “What’s God been telling you the past few days?” and we hold ourselves accountable to each other. Positive affirmation, when we do things like pray together, encourage one another, care for one another. None of this requires perfection, only faith and authenticity, the willingness to own our imperfections, and point to Jesus as God in the flesh Who died and rose for imperfect people like us and Who gives us our hope. The disciple’s lifestyle of faith is all made possible by God’s Holy Spirit, Who you and I received the moment at which we were baptized. He’s the One Who makes it possible for us to believe in Jesus (1 Corinthians 12:3). He’s the One Who fills us with the power of God (Acts 6:3). And He’s the One Who makes it possible to share Jesus with others, even if, like the apostle Peter, we’ve always been tongue-tied about sharing Jesus (Acts 4:8). Neither does any of this require our congregation to add another program or do a flashy ad campaign or get involved with things like politics. These are the things that churches do when they’re no longer following Jesus or relying on the Holy Spirit. All we need to do is follow, go, and seek while living a lifestyle of application, accountability, and affirmation, not in our power, but in the power of the Holy Spirit. Thank you for allowing them to go with me to Denver this week. And if you think they’re wows too, please thank God and them for their faithfulness to Christ by banging your hands together right now. By the way, I think this congregation--all of you--are wows too!